Popular parrot toys which are offered in pet shops may hurt your parrot seriously. Threatened are mostly bigger species because parrots play and chew the material on small bits. These bits can be swallowed consequently. According to the spokesperson of Czech Veterinary Association Josef Duben we should be careful permanently, even in the case of seemingly „harmless“ objects. Be wary of steel bells! „It’s necessary to consider the ability of big parrot species to chew almost everything they get. They can easily bite the cover of the rocking circle off and hurt by sticking wires. All fibers or wires can get stuck between the leg and the ring so birds panic,“ said Duben. 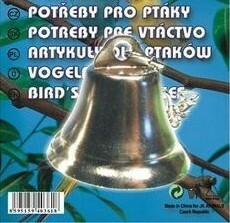 Even the sellers warn customers about the inside hearts in steel bells which can be removed and swallowed. That’s why it’s recommended to remove the hearts before the parrot will do that. The spokesperson warns also about home made toys. „I definitelly advise pet owners against providing any rubber bands to their pets. The gum can be easily chewed and swallowed. Or when any parrot eats cotton string then it mostly has serious digestive troubles,“ warned Duben. The same carefulness we should keep in case of plastic cups, bottles or other containers. Dangerous toys shouldn’t appear on the market at all and a trade inspection authority can impose a ban on selling of such goods. Pet owners who find a dangerous toy in any pet shop can report that to the trade inspection. Best toys are from wood. All parrot species should get wooden branches regularly. Those can also be used as perches. However, we have to change them for new ones as soon as they are damaged. Perches of regular shape are mostly not suitable for parrots. It’s dificult for them to grip by a beak or by nails. It’s useless to spend money on overpriced toys when you can easily go to the park or the forest and get something natural for your pet. Title photo: (c) Papooga. This file is made available under the Creative Commons CC0 1.0 Universal Public Domain Dedication.